If you’re thinking of building a new home then you know that the first step is to find a lot to build on. With more redevelopment inner city, often times the lot comes with an old home on top of it. 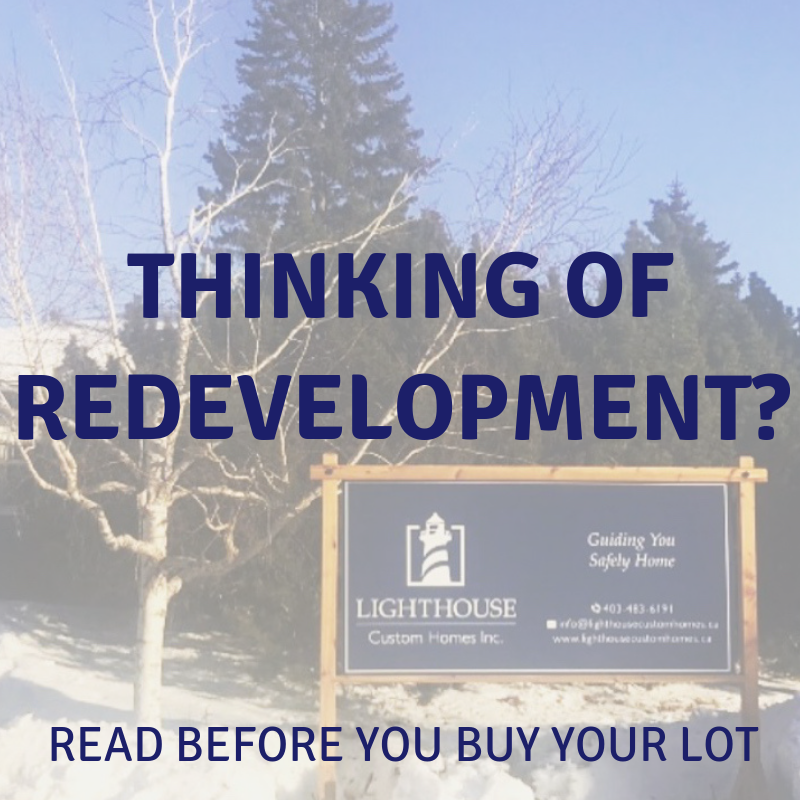 Although this has become the norm in Calgary, there are still some things to consider before going all in on the land. Reaching out to a Builder in advance to your purchase can help advise you on those different elements. Yes, size matters. You probably have an ideal size of home that you want to build, with lot coverage percentages you are restricted to 45% lot coverage in Calgary. So, depending on what you’re planning on building a Builder can advise if it will fit on the lot. Most of us have a budget that we want to stay under for our new home, but when purchasing the land it’s great to get some insight on approximate cost for your dream home before you overspend on the land. It also helps to determine if you’re over or under building for the area given the current market. Your Builder will have experience in this and can help advise on ball park costs and resale value in the future. Every lot has it’s own restrictions, from set backs (how far you can build the home from the road) to building heights (how tall your home can be.) Your Builder can help to advise you on the possibilities of the potential lot. Making sure if it is hindering your design that it is adressed before you purhcase. The house is going to have to go to create space to build your new home. The Builder can advise on costs, opportunities to actually move the home to keep it out of the landfills, possible tree removal and of course asbestos. Asbestos is something that must be tested for before any moving or demolition occurs. Asbestos remediation can swing your costs exponentially-even up to the $30,000 range. The Builder can coordinate the testing in advance to help reduce your risk. They can also help with the removal and permitting on your behalf. An experienced Builder has usually seen it all so to speak. So, when it comes to scoping out your lot, they can provide insight to avoid surprises later on. Depending on the lot, sometimes you may need some retaining walls, trees removed or shoring to neighboring homes which can add unforeseen costs to your home. Getting them accounted for upfront can really help save you some money and heartache later on.